Tonight is our Brownie Party For The Parents. The kids had to pick what we'd do for entertainment: they wisely chose singing after debating the pros and cons of a talent contest. For refreshments they have selected juice and biscuits. I SUSPECT that this was more what THEY would like for refreshments than what they think their parents would like. So today I have tried to work out what we're going to do - and have prepared song sheets and displays of work we've done this year (which they'll have to talk through).... Now I have to go to the shops and get the refreshments before battling with the alarm on the church for my first ever night opening the hall up myself. Last night was Eurovision! For anyone not in Europe, it's a big festival of tackiness. Each country submits a song and holds a phone vote on the night. The winner hosts the party the following year. My sister hosts a party for this event where her and her friends choose a country (by pulling the names out of a hat) then have to come in fancy dress from the country. I am not sure how far you have to take the game. My boyfriend and I play trying to find food and drink from countries. We then watch Eurovision with the score sheet to choose our own favourites. This year I phoned him at work and asked him to pick a number - which corresponded to a country on my sheet. He ended up picking: Finland, Azerbaijan, UK and Portugal. So we went to a specialist beer shop and he got a variety of beers. We went to the supermarket where I bought Portuguese green wine (which is my new absolute favourite thing... I want more!!). I made up a menu from recipes I found on the Internet. Portuguese - Salad with Portuguese sausage. Azerbaijan - Fried Chicken with stewed apricots and raisins served with saffron rice. Finland - Apricot Star Pastries. Snacks: UK - so anything we fancied! We had the salad and it was delicious. I then couldn't be bothered with making the main as we were full up anyway so I'll make it tonight. Around 11pm I thought I'd make the pastries (cheating by using shop bought pastry) but discovered that my boyfriend had bought frozen pastry and had left it in the freezer. So there's still a feast left for us tonight. UK - I thought it was quite good, but we got almost no points. On Thursday morning I realised it was the deadline for a music group directory of Scotland this Friday and I had two groups to enter this year. I tried to get the entries together but had to leave for my office job. So I accepted that I would have to complete the entries after work and hand deliver them later. By the time I got home and had the forms filled out with the bumph it was after 8pm. I then tried to muck about with working photos out at the correct DPI. What does that even mean? By 10pm I had decided just to put the entries in without photos. It's cheaper and I had spent two hours failing to decipher dpi. We then left with the documents in an addressed envelope using the sat nav to get to the postcode detailed on the form. The address was blah, blah, Abercorn School, Newton, Broxburn. It turned out to be 40 miles away! We arrived at the address the sat nav gave us to find that it was a closed up garden centre. We saw a sign for Abercorn and took the turn. It was a single-track country road. There were no lights. 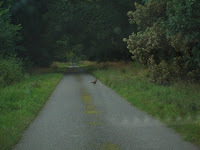 We drove down this winding road, passing junctions which appeared to be entries to forest walks. At each junction there was a barrier and in front of the barrier was a parked car. What could the people in the cars have been doing down a country lane in the pitch black at 11 o'clock at night?? We drove all the way along, passing about five houses one of which had a sign 'estate office' outside it. When we reached a town we pulled over and I called my parents to ask them to Google the place and see if they could find any more information. They discovered that we were in the right place on our single track road. The office was in the grounds of a country house which had a big sign saying 'no vehicular access' outside. We parked up down the country lane. I got out of the car and headed down the 'no vehicular access' road. There was a strange lively-looking caravan park just along the road, and another parked up but occupied car. My boyfriend was refusing to walk with me as the house was at least a mile along the road and he made me nervous of walking there alone by telling me it was the kind of place people would go hunting so he thought it would be dangerous. We drove back to the 'estate office' and I gave up. Still in pitch black I stumbled my way up to their entrance and squeezed my CD and entry form through the tiny letterbox. We left. The next day I emailed the office I should have delivered the envelope to, and the organisation who publish the directory and explained what had happened. I asked them to let me know if my entry was not received. I have not had a reply from either party. Oh well - We had an adventure and and 80 mile round trip so I definitely tried my best to get it there! Brownies.... parental responsibility. Or lack of it. For the last two weeks an 11 year old kid has been left at the church with one of my Brownies. No parent brought the girls in either week - they appeared. I suspect the 11 year old has been sent to walk the 8yr old to Brownies. To provide a bit of background: This Brownie has previously turned up with 'cousins who are visiting' and I let them stay as they were Brownie age and I had enough cover. The mother brought them in and filled out emergency contact forms. Last week (I was off sick) the 11 year old was told the Guides are full and she's too old for Brownies so she couldn't come back. My assistant guider told me that she was a pain - made comments all night despite being told just to sit at the side. This week she turned up again. I checked with the Guide guiders who told me they couldn't take her so she would have to go home, and that they had told her this the previous week. She made up some rubbish stories about bullying which aren't true (definitely - when I challenged them she backed down immediately). She told me that her mother was busy and not home, when I asked her to get her mother to come and speak to me. She didn't go home. She hung around the church I think for the whole 1hr 15mins. The plan next week is to phone her parents and have someone pick her up should she turn up AGAIN. Also I'm introducing a new rule - no guests at Brownies unless I've had a phone call to ask if it's ok BEFORE the evening. Presumably while she's hanging around there she's someone's responsibility - but whose? Only joking. I think it's nearly gone now. Sore throat is nearly gone. I nearly slept right through the night. The end. Otherwise, I'm about to go to see The Iron Man with my boyfriend aiming for the 10.10 showing. I then have to go to work this afternoon in the office. A morning cinema trip should make the day fun. I've seen the film already but he's excited (which is sweet.. and funny!). Today one eye is a lot better but I have a sore throat and have lost my voice. Which is fun when you're teaching. Fortunately my pupils are all great and helped me by not mucking about today. I am playing the trumpet like a girl though. Really weedy. Working tomorrow so need that to change. It's only a rehearsal though so not SO serious. Have any of you seen Pushing Daisys? Do you like it? I think it's the style of American show that promises much. Along the Desperate Housewives lines but it is proving uninteresting. I'm not an Anna Friel fan anyway. Forgot to mention - when I phoned in to work my boss complained that they were too short staffed... so I went in anyway. It was horrible! Nobody wanted to look me in the eye (don't blame them!) and my eyes water when I'm looking at a computer screen, which my office job requires. Oh well - lots better today. As to the computer: They left me an answerphone message, after calling on the wrong number. I have to take it back in and they plan to treat it as a new repair request. I don't think so! I'll be phoning them later on. I tried the USB port, which was the part of the repair that I didn't care that much about but thought I might as well get done, that delayed the repair by 21 days. 1. My computer is back - and I am happy. In case you haven't been here before (as I'm playing in a meme today) - my laptop broke a month ago and I have JUST got it back. 2. I have conjunctivitis, which is less pleasing. It is contagious and I job share in the office so don't have my own PC... currently debating the pros and cons of going in. 3. I feel OK - so could go in. 4. I hate taking sick days and this will be my second this year. 5. My vision is blurry. 6. I am contagious and share a PC - this isn't much fun and I would hate to give it to anyone else. 7. My eyes are pink and bloodshot. I quite want to post you a picture.. but it is gross. 8. I am producing gunk from my eyes. 9. The symptoms are not painful. 10. I think the contagious aspect of this is the big deciding factor. Also the docs said not to go to work for 48 hours because of the contagious thing... which means I should go tomorrow but not today. 11. I haven't done any practise for a day or so because even blowing my nose hurts my eyes. Somehow the prospect of blowing a trumpet is unappealing. 12. I'm hungry - time for breakfast. 13. Here we go with the next conundrum: Cereal or toast? I tried to do this - fab doodle done at work with a computer that works properly but it didn't upload correctly by email posting. On trying to recreate the picture here I have come across basic difficulties: My f'cking mouse doesn't work. Nor does the creaky old scanner. So until I have my laptop back I am not going to be on the computer again. Thirteen random things about me. 1. Yesterday afternoon I dug over a bit of the garden. I would have mowed the lawn but I was teaching at 4 and didn't want to have to get grass off my shoes and hoover the house again so postponed it. 2. Last night I was about to mow the lawn until a friend invited me out to a pub with a garden. So I postponed the lawn-mowing again. 3. My boyfriend isn't well and is having pretty disturbed sleep. I am keeping him company in his misery and have also had bad sleep since Monday. 4. We have been having funky dreams as a result of broken sleep. He dreamed he was the only patient in a 1000-bed hospital. He is ill so this makes SOME sense. 5. I dreamt about these cabin eco-homes that I am sure I saw on a blog once. I couldn't get onto the platform without hiking my skirt higher than my pants in front of a stranger. 6. My cat has also been playing a part in the sleep-deprivation with nighttime foot licking and chasing antics. 7. He's OK - he's still snoozing now. He will probably still be snoozing when I get home from work later on. 8. Tonight I plan to mow the lawn. Ha ha! 9. My throat is sore and I still have a cough. After 5 weeks now. 10. Because the docs say that it's just a virus I have been eating a lot of fruit and drinking water in an attempt to make ME healthier. 12. I do not love nectarines. I'll eat them if I'm hungry though. 13. I get an organic veg box delivered once a fortnight. It costs £14. I am thinking about swapping to a fruit and veg box but am worried that we will end up composting too much. I'd love to tell you about it but my laptop's broken and I'd rather go and sit outside than sit here and type any more. A morning's computer work has been done so it's playtime til 4pm! hi - I've been away this weekend but will catch up soon. If you can possibly manage PLEASE try to avoid the following at all costs. HMRC... Her Majesty's Revenue & Customs. Tax office. Or the British Government - they're all a'seholes. We pay a whole lot of tax over here and I am most unhappy about it. Particularly as they have just shafted the lowest earners in the country. I will provide you with a link so you can find out more. The 10% tax rate applied to the first few thousand you earnt - can't remember the details and can't be bothered to look it up right now. I'll update this if I get the urge! In this article Gordon Brown states that tax credits mean that low earners do not lose out by the government abolishing the 10% rate of tax. I do not get tax credits. Only people with kids get tax credits. It would be daft for me to have kids as I don't earn much money.... although if I'd get tax credits for it perhaps I should just get myself up the duff.... Nope, still need a better reason. Big bunch of jokers. Useless wastes of space. If you're thinking of buying a flat and find that you have ANY tie in with the GHA avoid it like the plague. After taking out government endorsed student loans back in the olden days the government (Labour have really done me no favours) sold a load off to Honours Student Loans. Honours student loans harrass me annually for repayment. You don't have to repay the loan til you earn about £20K. I am well beneath this bracket... therefore fill in a deferrment form each year. But the dates cross over. Payment is technically due to Honours Student Loans before the Student Loans Company (which is the company I actually took out loans with and still hold a couple with) process the forms. I hate Honours Student Loans. Bastards. so it aint gonna happen today.